Meals: In China breakfast, lunch and dinner. In Mongolia breakfast. -Beijing to Ulaanbaatar (1 night), Ulaanbaatar. Ulaanbaatar: Zaisan Memorial, National History Museum, Gandan Hiid Monastery, Hkarhkorin, Nomadic family visit. Arrival in Ulaanbaatar, transfer to hotel. Enjoy sightseeing as a Sukhbaatar square, Chinggis monument and the museum of Mongolian National history. We visit the Gandan Monastery and dry out of the town of Elsen tasarkhai, a picturesque combination of Gobi sand dunes, rocky mountains, lovely lakes and green grasslands. Arrive and transfer to tourist camp, lunch. Visit the Sand dunes and walking on the dunes. Optional hiking etc. Stay overnight at the ger camp. We drive to Kharkhorin, once once the capital city of Mongolian empire and later vandalized by the Chinese. Visit famous Erdene Zuu monastery from the 16th century built from the ruins of ancient Kharkhorin. Transfer to the tourist camp, dinner and stay overnight there. Today we drive to Hustai National park, where we will see the wonderful Takhi wild horses in the wild nature. 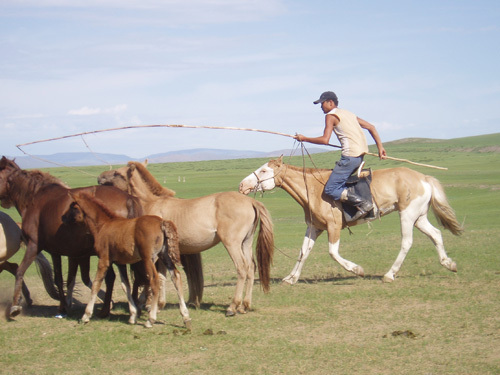 Stay overnight in Hustai National park and Nomadic family. 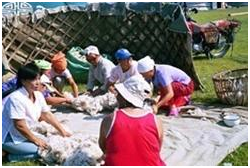 Visit a Nomadic family and learn about Mongolian nomadic lifestyle. Optional horse rising/hiking to see the wild sheep Argali and other wild animals. Bird watching at local lakes. Stay overnight at nomads Ger camp. After breakfast we come back to Ulaanbaatarand transfer to our hotel. We will enjoy the Mongolian traditional folk art as well as a visit to the Bogd Khaan the last king of Mongolia Palace museum and the Buddha Park. Departure flight for home or extend your visit for another tour.